Adventure is food for the soul. Therefore, over the years humans have invented different kinds of daring and electrifying activities to fuel their wanderlust. This brings us to backpacking; one of the most fulfilling and exciting expeditions of all times. Besides cultivating pleasure and enthusiasm, this noble course provides opportunities for learning, novelty and change, social growth, family and friendship bonding, and personal achievement. Backpacking requires thorough preparation because it comes with an array of unpredictable and spontaneous events. You might have a rough idea of your planned destination but the events that take place during the actual trip can seem out of the blues. One of the most critical essentials to consider is a backpacking pack. Literally, it influences every bit of your adventure and unless you have dug deeper to find your perfect match, things can go south within no time. 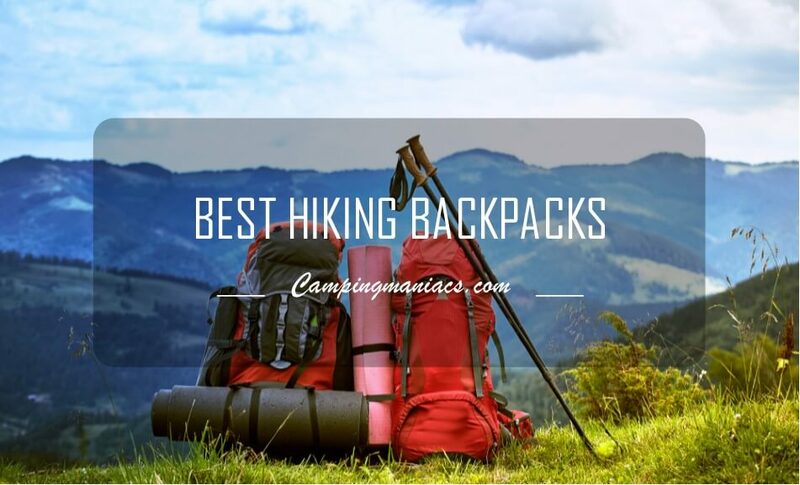 Choosing the right backpack can be extremely hectic because there are hundreds and thousands of manufacturers and each one of them offers quite a collection. Accordingly, we have decided to get most of the job done for you by identifying the 10 best backpacking packs. Our analysis involves keen consideration to ensure that you are rewarded with a rich and memorable hiking experience. Which are the best hiking backpacks of 2019? Let's take a dive into it and see which backpack best suits your needs. This is the most outstanding backpack that you can find in the market today, and therefore, a firm favorite. There is so much to write home about it and in the end, it only makes you fall in love. The pack comes in a wide range of colors. Whereas some are brighter than others, they all look great and adorable. It is constructed with high quality nylon material and the overall finish is amazing. It looks smooth but at the same time it is a tough pack that is not only strong but also durable. 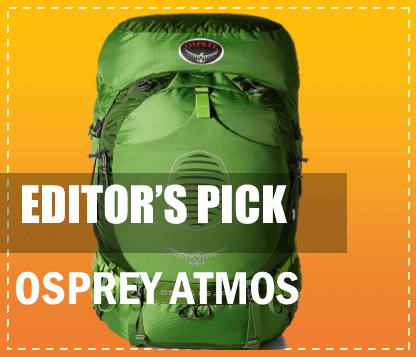 Osprey Atmos features anti-gravity suspension system that provides utmost comfort and balance. You do not need to keep pushing it up or adjusting the hip belt. Once you find the right positioning from the beginning, your trip runs smooth and flawless. It is fitted with a seamless back panel that features lightweight mesh for ventilation purposes. This keeps your back cool and comfortable. It also ensures that the movement of your body is not restricted. The structure of the suspension contours with the body creating a perfect fit. Most of all, the adjustable harness allows easy adjustment of the torso length. The shoulder straps are well padded and firm. They ease the pressure caused by the weight of the pack from the shoulder. A fit-on-the-fly hip belt enhances proper positioning around the waist line. It has pads that extend 5 inch/15cm so that hips of different sizes can get a custom fit. Atmos AG 65 has dual zippered front panel pockets where you can store items that you need to access easily. These pockets optimize the overall capacity of the pack even though the main compartment is already spacious enough. The upper section of the pack features a floating top lid that extends for more items to fit in. Side and internal compression straps have been provided to enhance support and stabilization of loads. Dual upper side compression straps enhance stability while cross functional compression straps are used to carry extra gear. Lastly, there is a stow-on-the-go trekking pole attachment system where you can attach your trekking poles. While all the backpacks in our list are awesome, this one takes the crown. It is super cute and lightweight at the same time. Furthermore, it comes in multiple sizes to ensure that everyone is covered. From one day to lifestyle backpackers, there is something that works for each one of them. The excellent suspension system of this pack allows each user to enjoy advanced comfort. Furthermore, with the numerous adjustment features provided, there is no excuse for feeling uncomfortable. This is another high quality pack with the ability to withstand all the challenges of a tough environment and bad weather. Equipped with a wide range of resistance, durability and comfort enhancement features, Badlands 2200 Camouflage Hunting Backpack rewards users with first-class services. Considering that this backpack is designed for hunting backpackers, its capacity of 2200 cubic inches is reasonable. It provides enough room for loading the necessary gear and packing up a good catch after a fruitful hunting trip. The bag features a built-in meat shelf that allows the aluminum frame to distribute the weight of the load evenly around the body. This protects the shoulders from getting overwhelmed. The pack has a thermos-mold suspension design which increases comfort and stability because it matches the contours of the human body. It conforms well to the human body thereby allowing the body to maintain its center of gravity. The material used to construct the pack is of exceptional quality. KXO-32 is known for its firmness and resistance to water. You can hunt with the pack during cold and snowy weather with full confidence. The approach color pattern has been used to ensure that the bag camouflages with the surroundings. It is less noticeable to the prey and therefore, does not complicate the process of hunting. Furthermore, the color adapts to changing lighting conditions smoothly. Badland’s 2200 has numerous pockets and straps. It has a total of eight pockets where you can distribute your load appropriately. The pockets feature strong zippers and are further supported by strong compression straps. It has a padded and adjustable waist belt that holds the bag into position around the waist. The shoulder straps are well-lined, padded, and adjustable. They allow the shoulders to support the weight of the pack comfortably. Other features provided in this pack include; hip belt pistol holder, zippered back panel access, a bat-wing design, and multiple compartments. You have no choice but to order this backpack if your hobby is riffle and archery hunting. Its environmental adaptive color will prevent even the animal with the strongest eyesight in the jungle from spotting you. After giving you a pass at this stage, you will definitely get a catch and it will grace your day again by providing enough packing space for your meat. The material of this bag is firm and durable. No matter whether you are hunting in deep forests or in rough snowy areas, it will always have your back. The versatility and quality of this pack are out of the ordinary. ALPS OutdoorZ Extreme Traverse X comes with a range of features that take it to an all-round flexibility level. It is constructed with first-rate 1680D nylon ballistic fabric that is tough and stress-resistant. The fabric feels and looks great. It comes in two jungle-friendly colors and whereas the coyote brown looks a bit laid back and traditional, the missy oak is quite stylish and fashionable. Moving on to comfort, all the major straps of this bag are designed to enhance it. The shoulder straps are wide and well-padded to reduce the impact of the weight on the shoulders. The waist strap is wide, padded, and adjustable to prevent the pack from sagging downwards. Additionally, the strap has a sort of bat-wing design for increased comfort and stability. The pack features a molded structural frame that curves with the body. This allows the weight to be distributed evenly around the back area. On to capacity, space, and related features, this pack can swallow all of your gear in a snap and leave enough space for a bunch of unnecessary stuff. It features a built-in stow-away meat shelf for meat storage. Plenty of pockets have been fitted to the sides and front area for extra room. All the pockets are fastened with strong zippers, buckles, and compression straps. Other noteworthy features that you can find in this pack include; hypalon fabric, lycra straps, fleece lined wing pockets, lash and loop points, rain cover, shooting stick and tripod holder, drop down pockets, and a waist belt that accommodates clip style holsters. The fleece-lined pockets are for spotting scope and that is where you find the shooting stick and tripod holder. Lash and loop points are for holding extra items when necessary. The rain cover and hypalon are necessary for reinforcing stress points. The shoulder straps require firm adjustment. Otherwise the pack tends to sit lower than expected at the back. Indeed, those who go the ALPS OutdoorZ Extreme Traverse X way never go back. This is because there is nothing better to pull them back. This pack is excellent for hunting backpackers. All the features that come with it are meant to make their experience in the field smooth and perfect. The colors camouflage with the surroundings allowing backpackers to lurk with ease like a leopard. The provided meat hauling solution allows users to enjoy the best that the pack can provide. This is a reliable and user-friendly pack that comes in a wide range of colors and color patterns. Since it is a military grade rucksack, most of the colors and patterns revolve around military hues. Overall, the pack is sturdy and capable of withstanding a range of issues that can subject it to wear and tear. Karrimor SF Sabre 45 Backpack is made of water resistant 1000 denier nylon fabric. The nylon material is further coated with silicone to improve strength and flex resistance. A finishing of fluorocarbon water repellent has been used for enhancement of the same. Do not hesitate to use it during rainy weather. The manufacturers have provided a variety of features to enhance comfort, balance, and stability when the pack is in use. Firstly, the pack has a cool mesh back system for ventilation purposes. This prevents increased sweating and accumulation of the same in the back. It features s-shaped shoulder harness to achieve advanced fit and reduce rubbing. This characteristic makes the bag an excellent choice for women especially the ones with a larger bosom. S-shaped straps are the most comfortable for women because they do not squash breasts. Shock cord carry system and a waist strap are the other comfort enhancement features provided. The waist strap is padded and adjustable. This pack is spacious and fitted with back and side pockets. The pockets are long and great for carrying essential such as toiletries, navigation tools, and water. The pockets are fastened with strong zippers and compression straps. This keeps your gear safe and secure. It has one main compartment and a removable F-format internal frame. Other important features of the pack include; a sternum strap, crampon loops, rotproof thread, bartacks reinforcement, twin ice axe holders, and zipped lid compartment. Generally, this is a bag worth buying especially if you are a woman. You enjoy the privilege of selecting your favorite color or color pattern and topnotch comfort especially around the shoulders and breasts area. The capacity of the pack is commendable and the exterior pockets are very spacious. As for those who want to get lost in the forest or bushes unnoticed, most of the colors provide this functionality. If an extra-large but ultralight backpack is what you have been looking for, here goes your perfect match. The capacity of this pack is something else. Literally, there is nothing that cannot fit in there. You get ample space for your gear without forcing in anything. Each item sits in comfortably and enjoys the ride. The space is further optimized through the provision of multiple side pockets and a sleeping pad compartment. All the side pockets have zippers and fastened with compression straps where necessary. A mesh pocket on the lower side pockets is provided to create storage room for things such as water bottle and other smaller but handy items. The bag is fitted with padded and adjustable shoulder straps. Additionally, their design provides users with the benefit of enjoying multiple shoulder strap positions. A padded mesh waist belt is provided to allow comfortable positioning around the hip area. The last of the support and comfort enhancement features is a vented lumbar system. ALPS Mountaineering Zion, Olive 3900 Cubic Inches is made of ultralight polyester ripstop material. This does not in any way compromise the quality but rather, it allows users to enjoy backpacking without feeling overloaded. Ultralight backpacking is very important especially when you are a beginner backpacker. It also comes in handy when engaging in prolonged backpacking through hilly and other forms of physically challenging terrain. Other valuable features available in this pack include: zippered lower door, hydration compatibility, spindrift collar with draw cord, ice axe loop, hold open bar, top loading, and top lid lash tabs. The zippered lower door increases convenience by providing an extra access point. This backpack is great especially if you are planning for a prolonged backpacking trip. Its large capacity provides enough room for anything you would need to carry. The ultralight design comes as an added advantage especially if you want to minimize the weight of your load. Overall, these pack offers multiple features at a pocket-friendly price. Eberlestock Team Elk Pack may not be your pocket-friendly buddy but it is worth every penny. Everything from the fabric to comfort and overall design is first-rate. The pack comes in three different colors patterns that include; droppelganger, timber veil, and western slope. These color patterns are designed to camouflage with the environment. The droppelganger and timber veil are suitable for hunting in the jungle and dessert-like environments whereas the western slope is a more favorable choice for deep forests and green lands. Beyond color and appearance, several features have been provided to enhance comfort. The most noticeable is the suspension system. It is designed with the structure of the human back in mind so that it can curve properly along the torso. Its back is fully padded and made with breathable material for ventilation purposes. Features such as an adjustable sternum strap, waist belt, and a tubular aluminum frame have been used to enhance the efficiency of the suspension system. The waist belt is adjustable to offer perfect control of packs positioning around the waist. The waist strap is removable thus making the pack more versatile. You can detach and attach it back anytime. It has small pockets around it for storing small and sensitive accessories. This pack features numerous pockets distributed on the sides and at the front section. There is a huge pocket at the front where you can fit a lot of things. All the pockets have zippers and compression straps for tight security. The manufacturers have optimized the space further by including multiple compartments both inside and outside the pack. These compartments include; a bow carrier, hydration pockets, and a build-in riffle scabbard. This is an all-round backpack and you can be sure that you pay for what you get. As a backpack hunter, you will enjoy distributing your gear in the many pockets. In terms of comfort, the manufacturers have put a lot into the waist and shoulder straps, the frame, and the well-padded back. All the provided colors are awesome and you get to choose your favorite. There are backpacks and there are backpacks for hiking and scouting. Here is one of them. Kelty Trekker hiking backpack is specifically designed to make the lives of hiking and scouting backpackers easy. From its bright garnet red color to the capacity and other crucial features, this pack is incredible. On to the specifics, the bright red color has been used to make the pack users stand out while on the move. This is fundamental for hikers and scouts to protect them from getting shot by hunters. As much as backpacks with camo and earth tones blend with the surroundings, they can expose users to a variety of risks. Firstly, it is very difficult to signal danger when your bag and clothes have camouflaged with the surroundings. Red, green, yellow and other colored packs make users clearly visible from a distance and easy to rescue. Bright colors are also good for scaring bears and other animals. They are an indicator to animals than human beings are coming. The suspension system of this pack is adjustable. It comes with effective features that allow the weight of the pack to be distributed appropriately. An aluminum external frame has been used to add stability and cushioning. The shoulder straps are wide and well-padded. They reduce impact on the shoulders significantly. The pack is fitted with a dual density foam hip belt that is easily adjustable. Belt stabilizer straps and a sternum strap are the other suspension system features provided. The capacity of the backpack is decent and the space is partitioned into a number of compartments and pockets for advanced organization. At the bottom section, there is a sleeping pad compartment. The front and the sides feature multiple pockets for carrying small sized items. There is a large pocket at the front that can hold substantial load. All the pockets are zippered and further secured with compression straps. External straps, loops, and lash tabs for holding gear such as ice axe, ropes and other tools have been provided. The other features of this pack include; hydration compatibility, reservoir sleeve, top loading, spindrift collar, daisy chain, load lifter straps, key fob, and hold-open bar. This is a good-looking and versatile pack. Since it is possible to collapse the sleeping bag compartment, it can function as a daypack. Its quality and performance are topnotch. The pack is constructed with high quality polyester material that maintains its toughness even when it is most vulnerable. Since numerous features have been used to enhance the compression system, this pack is very comfortable. This feature-rich backpack will provide you with an amazing user experience. It has too much to offer, all for your comfort and satisfaction. And since it is slightly pricy, the manufacturers have strived to compensate your money with an array of outstanding features. Off all the packs in our list, this one has the most access points. In total they are three and positioned strategically at the bottom, side and top. The access points lead to the main compartment. This is where you arrange most of your gear. Roamm Nomad 65 +15 has a capacity of 85 liters. This means that no matter whether you are going for a week’s camping trip or travelling around the world, it has got you covered. The space is divided into two major categories where the main pack is capable of holding up to 65 liters and a detachable daypack is designed to contain 15 liters. The design of the daypack is elaborate with features such as summits, adjustable straps, and an ice axe/trekking pole loop. The style of the pack provides fully adjustable shoulder harness. The shoulder straps are firm, thick, and adjustable. Additionally, the hip belt is padded and adjustable as well. The back is characterized by a lightweight alloy frame, frame sheet, and aluminum stay. All these provide you with a perfect fit even when carrying serious loads. Most importantly, the entire suspension is breathable for cooling and comfort reasons. The backpack is rich with pockets and compartments. On the sides, there are small mesh pockets where you can load things that need easy retrieval. For example, a water bottle, GPS, snack, etc. The hip belt has two oversized zipper pockets for carrying cameras and phones. At the front of the detachable pack, there is a large stretch pockets where you can put a lot of items. The bottom of the side pockets is reinforced so that users can carry items such as tripods and tent poles more conveniently. An adjustable sleeping pad diaphragm has been provided to keep your pad separate from the rest of the gear. A reservoir sleeve and ambidextrous hydration ports have been provided to keep your body hydrated. In case you encounter extreme weather during your adventure, there is a high visibility waterproof cover to protect your gear. Other interesting features of this pack include; front organizer pocket, sunglasses pouch, sternum strap, reflective strips, and reinforced top grab handle. This one of the best backpacks you can find in the market today. It has so many features that take it to a whole new level. Furthermore the quality is impressive. It is a very easy bag to organize and depending on the nature of your adventure you can use the main pack or the daypack. Alternatively, you can carry the entire bag. It is made of high quality nylon material that makes it even more impressive. ALPS OutdoorZ Commander + Pack bag is among the largest packs in the selection and also the cheapest. Unlike what many may assume, the price does not compromise the quality. Its features are standard and the overall quality is great. The bag is made of nylon ripstop fabric because it is durable and capable of withstanding harsh weather conditions. It has a top loading design, one main compartment, and a total of five other pockets. On the sides, there are two accessory pockets for carrying small items and one spotting scope pocket where you can put larger accessories. There is one medium-sized pocket at the front section. This provides space for items that you would need to access easily. A drop down rifle holder pocket has been provided to keep your rifle safe and hands-free. At the lower section of the backpack, there is an access point that has NO. 10 zipper and an internal horizontal divider. This backpack can be detached from its frame and used alone. The frame can also be used alone as a freighter frame. The pack features a spindrift collar design to create extra room for storage. Additionally, there are four webbing loops at the back where gear such as tripod and trekking pole can be lashed. The design of the pack is water compatible and thereby it features a hydration port and pocket. With a capacity of 5250 cubic inches, this pack provides you with more than enough space for your gear. You can carry everything you need and achieve great organization because of the numerous pockets provided. The bottom access door provides you with an alternative for retrieving your gear easily. This saves you time and stress. The versatile design of the bag allows you to detach it from the frame and use the frame as a freighter. Overall, considering all the benefits that you derive from this backpack, it is worth more than you pay. From quality to capacity and durability, everything about this backpack is exceptional. Its overall design offers a wide range of features that are meant to improve the user experience significantly. Let us begin by discussing its 5,500 cubic inches capacity. This means that it can accommodate a load of up to 90 liters. It allows users to load up all their essentials and squeeze in some luxury items. The pack offers a wide range of pockets for even load distribution leading to improved balance and stability. There is a total of three zippered pockets on the sides (one long and two short ones), one at the front section, and the core zone is divided into two compartments. The small pockets are spacious and capable of holding quite a number of accessories and small-sized gear. All the external pockets are fitted with compression straps to ensure that the load is well squished and supported. This reputable pack has a frame made of aluminum alloy which is tough and durable. The rest of the body is made of 420 denier coated pack cloth. The pack can be used for hunting, hiking, and prolonged backpacking in all kinds of weather without undergoing any form of wear and tear. The suspension system is fully adjustable to a range of 16-22 inches. It is easy to achieve maximum comfort with this kind of torso adjustment. This feature, combined with a 3-layer padded adjustable waist belt and padded pre-curved, yoke style shoulder straps allow perfect fit. Other interesting features available in this pack include; daisy chain and lash points, a sleeping pad compartment, belt stabilizers, adjustable sternum strap, 5 lb 9oz weight, top loading design, and a mesh back for increased ventilation. The last points and loops are important for attaching ice axes and other accessories. A sleeping pad compartment allows users to roll in their sleeping pad conveniently. Belt stabilizers come in handy for adjustment to achieve a more comfortable fit. This is an all-time go for pack and most importantly it is budget friendly. Although its design and style is quite traditional, the pack is reliable and reputable. You can never go wrong with it. Its incredible capacity provides users with limitless opportunities especially when it comes to selecting trips. They already know they have the right pack to hold up more items than needed. The amount of load that a backpack can carry is an important factor to consider when choosing a backpack. Depending on your body strength and fitness level, choose a backpack that has the right capacity for you. It is never about the largest or the smallest pack. It is about what works best for you. The term design covers a wide range of issues. From the weight of a pack to internal and external features, a great design provides you with extra comfort. Depending on the nature of your trip, you can choose from multiday, weekend, or extended-trip backpacks. Weekend are smaller and less bulky bags that allow users to carry just enough gear for a weekend out backpacking experience. Multiday backpacks are very common especially during hot weather trips. Their capacity is suitable for an up to 5 day’s trip. Extended trip backpacks are commonly used for prolonged backpacking trips. They are large and spacious to accommodate a lot of items. Alternatively, you might want to go for an ultralight pack. This is supposed to make your load feel lighter. Beyond the overall design of a pack, consider factors such as side pockets, main compartment, hip belts, and shoulder straps. All these should be well designed to ensure that your pack sits comfortably on your back. A great suspension system is a guarantee of comfort, balance of stability. Once you go wrong with this, your entire trip turns into a total mess. Scrutinize all the features that are designed to improve the suspension system keenly. Examples include: shoulder straps, waist belt, and the frame of a pack. Parting with more money is sometimes a guarantee for a higher quality product. Save up enough money for good quality backpack. Backpacking is challenging and it requires packs that are capable of holding a lot of weight without falling apart. The suspension system of a pack is another critical factor. You would rather pay more for extra comfort. The right material allows you to utilize the capacity of your pack with full confidence. It can handle a lot of weight without getting stressed or torn. Furthermore, it withstands rain, heat, snow, and all the other environmental challenges that you are likely to encounter while backpacking. Generally, pick a pack with strong and durable material. We all have different views on how to pack a backpack. Even though there is no view that can be termed as superior, there is a way in which a backpack can be organized to accommodate more items with even distribution of weight. The standard design of a backpack features five main sections that include; the bottom area, core section, top zone, accessory pockets, and tool loops and lash points. Even before you think about organizing a backpack, it is important to ensure that you acquire a pack that features all these sections. This makes your load easier to carry thereby spicing up your hiking experience. After selecting the right backpack you can begin the process of organizing your gear. The objective here is to maximize space while making the load more convenient to carry for a long period of time. Based on the human’s body center of gravity a load that is light in the lower section and has a heavier upper section is the easiest to carry. Accordingly, the bottom section of the pack should accommodate light and soft items such as sleeping bag and pad. The core section should take up all the heavier items of your load. This is because it sits directly on the back. Ensure that they sit slightly higher on the back to keep the body balanced. The weight should be evenly distributed all-round the section to prevent your body from getting over-exhausted on one side. Some of the items that you can pack in this section include; water, stove, cooking kit, food, fuel, and trash bag. You can squeeze soft items such as clothes into the remaining spaces to prevent gear shifting. Bulky items should come last at the top zone. Examples include; tent, rain cover, rain jacket, and fleece pants. Small items and accessories should be packed in the side packets. They include things such as sunscreen, compass, GPS, lip balm, toiletries, flash light, match boxes, trowel, pocket knife, sunglasses, nylon cord, and map. Lastly, strap tools such as ice axe, clamping robe, trekking poles, tent poles, and crampons on the tool loops. Put the needs of your dog in mind and consider the essentials that he/she might need in your planned adventure or vacation. For example, if your dog is on medication, remember to carry the drugs and the food that he/she takes together with them. Also, remember things such as water, nail clippers, file, and towel. The ultimate goal of every backpacker is to carry an ultralight backpack without leaving behind anything they would need in the course of the trip. Although the weight of a pack is normally determined by the items needed for a trip, it is possible to compromise some things for a much lighter load. Here are some tips to achieve an ultralight backpack. Readily cooked food is sweet but it is not always necessary when you are backpacking. Considering the weight and space occupied by a kitchen kit in a backpack, carrying dried food, nuts, and protein bars is a much better option. Alternatively, if you are backpacking across regions where you can find shops, restaurants and supermarkets after a two or three days, carry small food substances at a time. Items such as elaborate hiking boots can be very heavy even though they are vital. However, if you are not travelling to a location with highly sensitive terrain and weather, you can consider light but well-designed shoes. Substitute heavy water reservoirs and utensils with simple but reusable items. This does not deny you the comfort of enjoying your food and water. There are some luxurious items that can be sacrificed to make a backpack lighter. For example, if you are travelling in a group of five, a camera, binoculars, and other items that do not fall in the category of necessities can be restricted to one person for each item. This means, as a group you will end up with one camera, one binoculars, and so on. There are some double-walled tent designs that make shelter gear very cumbersome and heavy to carry. When possible, these can always be substituted with other forms of shelter that are lighter and come with lesser accessories. You can check out our latest reviews on best and ultralight tents for backpacking. The essentials of backpacking are many but they can be grouped in to smaller categories that are easier to remember. The section below provides the simplified overview in order of importance. This is a basic need that you cannot travel without. The body needs constant supply of food and water so that it can endure the hardships of backpacking. Since it is impossible to stay for a long time without cooked food, we have included kitchen tools and accessories in this category as well. The kind of clothing that you carry is largely determined by the nature of the trip. Whether it is during hot or cold weather, carry the appropriate clothing to avoid inconveniences. Below is a list of the most important clothes for backpacking. Warm weather clothing (hiking shoes and shoe accessories, moisture wicking t-shirts, pants and shorts, sun hats, long-sleeved t-shirts for extra-protection from direct sun). Cold weather clothing (Fleece jackets and pants, gloves, boots, rain coats and pants, balaclava and caps, warm sleeping clothes, wicking long-sleeved shirts). Extras (socks, sandals, gaiters, underwear, insulated jacket, easy to wash and dry clothing accessories). Unless you intend to spend the entire night shivering in the cold, you must have all your sleeping essentials with you. Below is an overview of the critical ones. Sleeping bag and pad, blanket, pillow or pillow case that can be stuffed. Trekking poles, day pack, rain tarp, stakes, etc. No matter how we overlook somethings, it is impossible to go a day without them. Here is a list of the unavoidable ones. Tooth brush, toothpaste, and mouth wash. If you are travelling during hot weather, it is important to carry the necessary sun protection essentials. Exposing unprotected skin to the sun can lead to painful sunburns and other serious health complications. Sunscreen and body moisturizers with sun protection agents. Sunglasses (Use clip on sunglasses if you wear spectacles). You never know what can really happen when you are out there in the world. This is particularly true if you are a beginner backpacker. Have your first aid kit ready for unexpected twists and turns. Appropriate medications (in case your body is prone to allergies or you have an underlying health condition that can cause alarm anytime). Now you have had yourself sorted. Almost everything concerning you and your health is in check. Move on to the essentials that are intended to make the trip easier. Begin with navigation gear to ensure that you do not start on the wrong foot. Map. Your map should feature a protective case. Lighting for both inside and outside the tent is very important. You cannot trek in unknown places without lighting when darkness begins to fall. Nylon cord for hanging food. Phone and other tech devices. We thought that you might need these tips especially if it is your first time backpacking or hiking. As a backpacking beginner, it is important to conduct thorough preparation to ensure that you do not expose your body to risks it cannot handle. Firstly, you must conduct a fitness check before familiarizing yourself with the sports and recreational activities that you will encounter in the course of your trip. Generally, the body must develop skills that provide a foundation for endurance and flexibility. The process of fitness training is known as acclimation. New environments come with a variety of physical demands. Starting from the weather to the terrain and nature of activities, the health of an unprepared body can deteriorate significantly. It is easy to get injured and dehydrated or even develop other opportunistic diseases. The first step before engaging in fitness training is consulting a physician for clearance. This gives you a record of the condition of your body so that the fitness program can be tailored towards its needs. Generally, the best way to prepare the body is by engaging in activities such as aerobics and other activities that lead to improved lower and upper body strength. Aerobics also help with flexibility and endurance conditioning. For outdoor training, try walking, swimming, and cycling. Sometimes with a pack on your back to help your body adapt to the coming change. These exercises are very effective. Ample training time ranges between 3 to 6 weeks. Divide your time between strength, cardiovascular, and high intensity exercises. If your body is not used to exercises and aerobics, start slow to avoid injuries. You can also hire a trainer to help you make controlled body motion. Sometimes trying so hard can lead to exhaustion and soreness. Start with less strenuous activities and incorporate more complex movements once your body is fully adapted. Always ensure that you gauge your progress to avoid over-training. If you want your first backpacking experience to be great, give yourself enough time to assemble the necessary gear. This is not an easy step because it calls for keenness on details and it can be quite expensive. Take time to identify the needed items and how to acquire them. It is important to buy the gear yourself because what works for someone else might not work for you. Create enough time for shopping. Ample time allows you to look into different stores and compare prices. It also prevents inconveniences by allowing your items to be shipped on time. Read and watch videos about specific items so that you can acquire the best gear depending on your personal needs. Have in mind that the nature of an adventure determines the gear that you purchase. For example, you cannot buy gear that is suitable for hot weather when preparing for a trip during cold weather. Similarly, you cannot carry gear intended for a short trip to a long trip. After you have shopped for all the necessary items, try to pack and unpack your backpack for weight management reasons. Backpacking is always easier with a lighter load. A heavy backpack can compromise your speed and body strength because it interferes with the stability of your body. Even worse, it can lead to injuries. The overall goal is to keep your body safe and stable throughout the trip. Generally, it is recommended that the weight of a backpack should not exceed one quarter of its owner body weight. The history of backpacking is quite long and full of and turns. It goes back to the time of early European exploration. It began as what can be referred as a ‘hippie subculture’ in a time when less value was attached to tourism and adventure. Unlike traditional tourism that was mainly practiced by parents and required a lot of investment, backpacking gained roots among youths or rather students who planned trips to explore nature with their gear packed in a backpack. Besides, setting their own trend (outside of parents’ norms and traditions) the backpacking trips came with fulfilling activities and at a friendly budget. For example, accommodation was not a problem because they were willing to share rooms. The earliest travel expeditions did not begin with students though. They were popularized by wealthy European men who toured different countries in their youth before opening the doors for marriage. This was a form of personal fulfilment that came with increased open-mindedness and learning. Since that time to early 1900s, nothing serious happened in efforts to advance backpacking hiking. During World War 1, most Americans began to consider overnight camping over other forms of tourism because of the crisis that wrecked their economy. This was a cheap and effective recreation approach. As backpacking gained a firm foundation, many hiking trails were established. The Pacific Crest trail, Assateague National Seashore trail, Great Falls Park, and Appalachian Trail were the most common. Some of these trails were very long and span across thousands of kilometers of land. It would take months to complete one trip in some of the trails. Later in the mid-1990s, a group of students set out on a hiking expedition through a trail referred to as the Silk Route. This is a very interesting rout because it connects the West to the East. This marked the beginning for the Hippie Trail and backpacking subculture. The route cut across different regions and it brought together tourists from Europe, America, Canada, and Japan. Availability of legalized marijuana in the Arabic region cultivated a rebellious norm in the hippie subculture. The youths strived to counter the conformist nature of their parents. As they attained increased freedom, challenges such as illnesses and sometimes death followed them. However, most of them managed to get back home safely. Around the early 1970s, the Hippie trail was marred with numerous challenges because of political unrest in some countries. As people searched for alternatives, other trails emerged in America. Overtime, more people began to embrace backpacking and the fun that come with it. Currently, people all over the world engage in backpacking and there are many trails and routes for the same. A life worth living is one that comes with determination and zeal to achieve some set goals and objectives. Visionary people never really care about how the rest of the world views their plans and objectives. They spend the best of their time and abilities curving a path that leads to these commitments. Adventure and backpacking in particular is one of the things that backpackers include in their to-do-list. Just like a failed project or a plan that fails to start at all leaves a void in the heart, the same damage occurs when a backpacker misses a travel opportunity. Backpacking is an early-age goal for some. They must do it in the early stages of life where freedom is freely granted. The stage of adulthood comes with commitments that can hinder travelling and other personal goals. Work, bills, and family responsibilities are the three major issues that influence adulthood. You can run away from one or two but it is impossible to be completely free from all of them. Furthermore, finances become too tight at this stage and since travelling is an investment, it is very easy to miss it. Backpacking is widely perceived as a right-of-passage. The history of backpacking is deeply-rooted in a form of culture that was mainly cultivated by youths in the smid-1990s. The culture was mainly characterized by escapism and increased desire for exploration, long periods of travel, freedom notions, budget-friendly adventure, flexibility, and movement across multiple regions. Traditional backpackers were nomads in some way. They sought fun, excitement and every other thing that comes with backpacking by drifting away from the norm. In fact, whereas conformist tourists and everybody else referred to them as hippies, they addressed themselves as ‘freaks’. These wonderers had the true spirit of wonder. They were young, wild, and free. They had preference for pocket-friendly exploration where accommodation was not really a major issues. They packed their sleeping gear and were willing to share small sleeping spaces. Today, there are multitudes of people who have the desire of pushing this culture forward. They see backpacking as an incredible culture that needs continuation from one generation to another. However, its nature has changed significantly. Today, most backpackers engage in short-lived adventures. Backpacking is one of the best ways to grow social skills. Besides bringing different kinds of people together, it provides a golden opportunities for engaging in an array of social activities. The backpacking world can only be linked to a cosmopolitan city where people from different social and culture backgrounds meet and exchange fun ideas. Most importantly, backpacking attracts both young and elderly individuals. There are some individuals who turn backpacking into a lifestyle. They are sometimes referred to as ‘drifter tourists’. They extend their adventures for many years while moving from one location to another. There is a lot of beauty in lifestyle backpacking. It is socially recognizable and it gives its practitioners a unique sense of self. This way of life allows individuals to rediscover themselves while opening up opportunities for acquiring vast first-hand knowledge. Lifestyle backpackers go an extent of exhausting their savings while on the move. This forces them to acquire formal jobs in foreign locations to save up more money for their ongoing journey. Lifestyle backpacking is motivated by both positive and negative factors. Some of the main triggers include; research reasons, wonderlust, spiritual nourishment, personal identity purposes, failed families and relationships, childhood tourism experiences, deaths of important people, failed career, and recovery from drug dependency. Therefore, lifestyle backpacking can be either a form of exploration or escapism. Backpacking is one of the most convenient ways for achieving body and mind relaxation. Today, people live in a society where there is a standard laid out manual for everything. Most people wake up at the crack of dawn to leave for work from Monday to Friday and get back home during sunset. On Saturday they engage in home chores such as cleaning and go to places of worship or relax on Sunday. Clearly, this is a very hectic routine and anyone would part with a leg and an arm for a more comforting change. Backpacking provides a break from everyday life and the stress that comes with it. It allows backpackers to indulge in recreational activities that allow them to forget all the stressful bits of their lives for a moment. Backpacking is the only form of tourism that offers unlimited freedom. It is an opportunity for leaving everything else behind without paying much attention to the likely consequences. Backpackers set themselves free from ordinary lives and open their hearts and minds to meeting new things, people, activities, and creating new experiences. Most importantly, this works effectively with or without handsome money because it is never about comfort. Backpacking provides an easy way for seeking knowledge about places, people, recreational activities, and backpackers themselves. Researchers discover a lot of information by interacting with fellow backpackers. For example, they learn about the motivations behind backpacking, the benefits of backpacking, backpacking routes, and the most interesting activities during backpacking. In life, there are things we do to challenge ourselves and to some, backpacking is one of them. The adventure itself is quite challenging. It is an art of survival where people trade their comfort for freedom, independence, exploration, flexibility, learning, and spiritual nourishment among others. Backpackers survive with limited resources and sometimes, in unfriendly places. On the other hand, they gain a completely different life experience. Backpacking is quite risky. Imagine going to a place you barely know (in case you know the place anyway) for a long period of time and on a tight budget. Backpackers leave behind all the comfort you find at home with friends and family. Sometimes they travel alone and leave their loved ones and everything they own. They risk their lives in dangerous places and experiences holding on to the idea that after completing the adventure successfully, they will find everything in perfect condition back at home. Although this works out smoothly for the majority, some lose their lives in the course of the adventure. The nature of backpacking requires individuals with great physical strength. It is difficult to walk for long distances with a load on your back throughout if the physical condition of your body is questionable. Sometimes backpackers go to places where roads and shelters are inaccessible. This keeps their bodies engaged in physical action until darkness kills the night. Although walking alone is not physically risky, some recreational activities undertaken by backpackers push the body to the extreme. It is possible to develop serious injuries that can be fatal with improper medical care. Unlike conventional tourism, backpacking exposes people to dangerous animals and places. Backpackers tend to use risky routes that sometimes harbor animals such as elephants and mosquitos. It is very easy to get attacked or contract dangerous diseases such as malaria. Besides animals, natives along some routes and destinations can be unwelcoming. It is possible to get attacked by suspicious inhabitants or malicious people and thugs. Backpackers carry their sleeping gear with them wherever they go. This means that they can set up their tents nearly anywhere and sleep. Although tents may appear cool, their safety is highly questionable. Firstly, they expose users to extreme cold and if well-ventilated the openings provide through passes for deadly mosquitos. This is very risky because the body can develop serious health conditions. The other major risk of tents is security issues. It is very easy for thugs to attack tents because they do not meet standard security measures. Backpackers commonly use butane and propane heaters to keep their tents warm. As these gases burn, they consume a lot of oxygen and produce excess carbon dioxide that is very dangerous to human health. This explains the need for proper ventilation in a tent. Heaters especially the ones that produce a flame can also initiate fire. Backpacking for a long time forces backpackers to eat food in unfamiliar places. Such food can cause infections because their bodies are not used to it. Furthermore, ready-made food can sometimes raise hygiene questions. Travelling to unknown locations causes culture clash. Backpackers meet people with completely different ways of life and beliefs. This includes social tendencies, religious believes, and eating habits. Cultural differences can lead to physical differences if not addressed properly.